Abu Dhabi: Adnoc Distribution is giving a crash course to their customers on self-serve counters in the capital since the new system was introduced at 40 odd petrol stations. Motorists said the new options are inconvenient and many motorists are apprehensive of the Smart Tag system, which aims to make refuelling and payment easier for self-serve customers. “It is a learning experience at the moment for me but at peak hours it will be a worry, especially because everyone is not going to get a hang of things straight away. To avoid the ordeal, people will end up paying that little extra and that’s what they want,” said Ramesh S, an accountant. 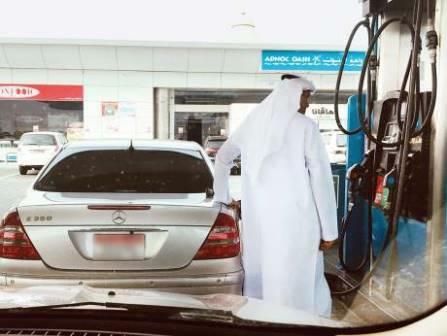 Yes, people are reluctant to step out and try self-serve, especially Emirati customers. So it looks like it will be the expats who will opt for self-service to save that extra money,” said a petrol pump attendant on condition of anonymity. The new refuelling options were first introduced at select stations in April, with some queues being dedicated to self-serve, and others labelled Premium, where an attendant ‘pumps the gas’. This attendant assistance will eventually become a paid service. Customers, however, feel that there are fewer self-serve lanes at petrol stations than premium ones, which will end up creating long queues and delays once the new refuelling options are fully implemented at petrol stations. “If you don’t have time, you are forced to shell out Dh10 even though you are willing to step out of your car and refuel on your own. In addition, there have been instances where I have driven into the premium queue because it’s simply not something I notice yet. Nobody here at the petrol station told me about the Smart Tag system either,” said M.Q., a long-term resident of the capital from Bangladesh. The Smart Tag installation to the nozzle of the car’s petrol tank is an initiative by Adnoc Distribution to make payment easier for self-serve customers. The tag can be installed by booking an appointment and visiting one of three petrol stations in Abu Dhabi city and one in Al Ain. Adnoc Distribution has already announced that more than 141,000 Smart Tags have now been fitted into vehicles across the country, including 29,500 since Adnoc Distribution launched a free giveaway.